The two weeks of the Olympics is over, what an incredible two weeks it has been. It is refreshing to see the newspapers and television reflecting good news for a change. The stories of the athletes and their personal journey to reach the games, have been so heartening to hear and marvel at, and to share their joy and heartache. I hope you aren't too fed up with seeing another post of the Olympics from Weymouth. Last Sunday was what was termed the "Battle of the Bay", between Team GB's Ben Anslie and the Dane Jonas Hogh-Christensen. 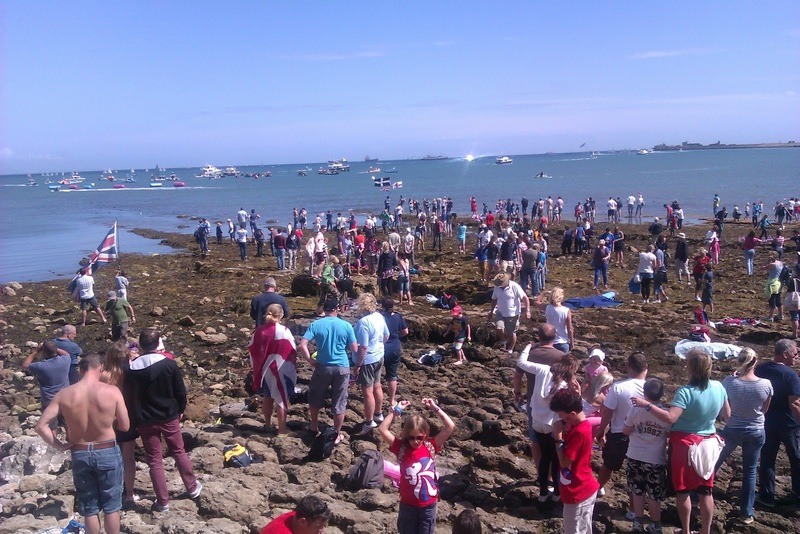 Over 100,000 people visited Weymouth and Portland to watch this particular race. Ben Anslie won the Gold despite Jonas having a two point lead. It was the 4th Gold Medal he has won at consecutive games, making him the most successful Olympic sailor ever. The atmosphere was amazing with so many gathering close to the shore to cheer on the sailors. This included my family and myself, but unfortunately a mishap occurred to me! I was excitingly waving at the Norwegian sailors (the saying every girl loves a sailor comes to mind), and in doing so dropped our camera on to some boulders and it disappeared out of sight! Although we were able to see it we couldn't reach it until one of my sons' friends came to the rescue. Unfortunately it is broken beyond repair, so some of these photos have been taken with a phone instead. 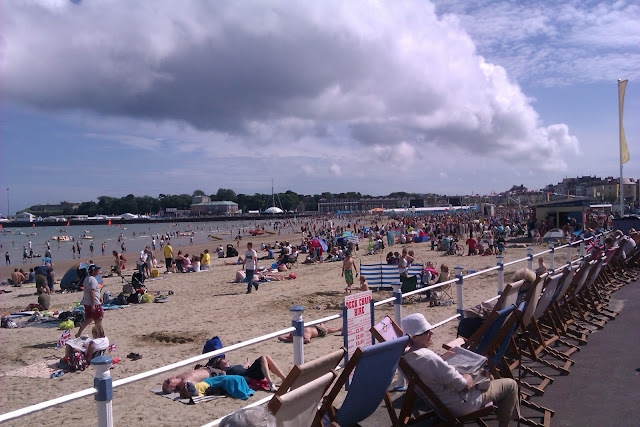 Weymouth beach after all the competitions had taken place. The Australians came at the top of the sailing medal table with Spain 2nd , Team GB 3rd, Netherlands 4th and New Zealand 5th. congratulations to them all . 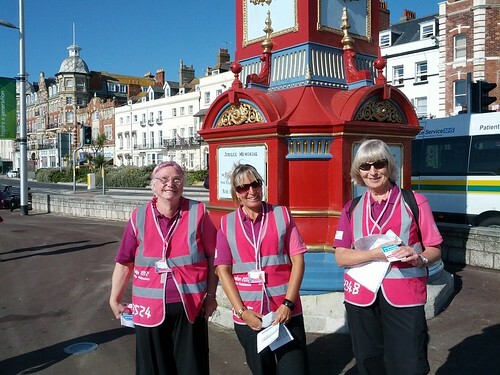 The success of the games has also been thanks to the work of the 600 Volunteer ambassadors who have given up to 2 weeks of their time to to look after the visitors around the streets and ticketed area in Weymouth and Portland. It was so hot on Thursday and after a successful day house hunting for my son in Exeter we decided to go down to the beach with my daughters boyfriend and have a bbq to round off the day and cool down. As we were finishing our food a Chinese reporter and camera man came down on the beach to do some filming. They saw me taking a photo of them and asked whether they could interview us. It was the first time they had been to England and they had come down that day to see the Olympics in Weymouth. Daisy was memorised by the microphone I think she thought it was something to eat! It felt very surreal especially when we found the interview on the internet later! Hope you have enjoyed the Olympics too it is so unique how it brings everyone in the world together. This is all so exciting to have been there. It looks like a wonderful day. Sorry about your camera. How exciting that you are a star in China! Dear Sarah or should I say TV celebrity! A great post although I'm sorry to hear about your camera. I did the same, funnily enough, in Weymouth many years ago - drop my camera and damaged it beyond repair on the first day of our holiday. I treated myself to a new one and discovered a brilliant camera that I wouldn't have thought of buying had it not had the accident. We have bought another make of the internet that hasn't arrived yet so hope it will be as good if not better! Dear Sarah, First let me say, i am sorry about your camera.. thats awful. At least you had your mobile.. Great photos of the sailing.. being a retired sailor myself.. i love the sailing. unfortunately i missed it on tv.. there were so many events. Ainsle is a great sailor. Team GB did very very well. I really enjoyed watching the events that i could. Weymouth looks a beautiful place. I think you will all be on a high for a long time in the UK.. it was all brilliant. thanks for sharing these photos.. great to be on chinese tv..
You have shown some wonderful views from Weymouth. Such a pity that your camera is no more, but so much excitement down by the sea!! The olympics have truly been amazing, we have felt so proud that little old blighty has shown the world what we can do. So sorry to hear about your camera, but I love the fact you found fame on the beach!! The whole Olympic experience has been brilliant hasn't it? And how exciting to be interviewed, so now you're famous in China! I have enjoyed your sailing posts very much, sorry about that camera, of yours! Have a lovely week Sarah.. Imagine that, you're now a celebrity in China :-) I'm so sorry you lost your camera though, I'd be lost without mine. I followed the Olympics while on holiday and everyone seemed to be having a great time, I hope this uplifting feeling stays for quite a while after it finishes. I'm waiting for the closing ceremony now. What a shame about the camera but you have some great photos of the day anyway. Sounds like you had a really good day! Thanks for the birthday wishes... I did the candles in one (long!) blow but I guess the more candles I get, the more blows they'll take! Like always, they go by so fast. Thank you for sharing your photos of the Olympics with us. Have a wonderful week. The photos was from the Mens Star race. The New Zealand Women did so well , unfortunately I was working on that day and heard the results as I was driving home. I would have liked to have seen it! I am mourning the end of the Olympics! But not long til the Paralympics start, but there's never enough hours of coverage of them unfortunately. I've loved seeing your perspective, I think I saw those cliffs in a video on the Olympic coverage - so beautiful. I'm so sorry to hear about your camera - they do become a bit precious to us don't they? I hope you are able to replace it soon. Hope you have a wonderful start to the week! It's all been so exciting hasn't it - I didn't think I would like it, but we've been practically glued. Sounds like a fun time you have had, watching with the best view in the house, being right there where all the action was. So sorry about your camera. It must have been so much fun being part of the cheering crowd and enjoy the sailing. It looks like you had perfect weather in Weymouth too. I watched it all on tv. What a great event! It looks like it was a brilliant day with a great atmosphere, but what a shame about your camera. Fancy getting on Chinese television too - what a hoot! Do you have a link to the website it appeared on? I haven't shown it as I am doing the typical thing of speaking so slowly , it was quite embarrassing!